Channel letters, Custom Sign Cabinets, & Channel Letter Sign Supplies. Channel letter signs wholesale channel letter cabinets and channel letter custom design LED signs come in all size and shapes providing a great looking Channel letter business advertising signage while saving significant energy dollars with Signs Plus of Kentucky delivers LED Channel Letter Signs. Each Custom Channel letter sign is unique and made to your specific requirements. 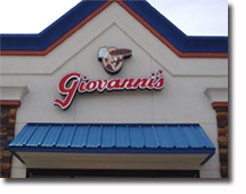 Channel letter Signs are energy efficient, low voltage, and virtually maintenance free. Not only is our LED Channel Letter Sign energy sufficient, but the lightweight design almost guarantees elimination of breakage. Custom Channel letter signs can be fabricated to any shape or size, including your business logo or just a standard shape. Custom Channel letter signs have endless possibilities for your custom channel letters with custom Logos and Designs. Signs Plus, LLC can handle all the channel letter sign design, manufacturing, installation, and maintenance that you’ll need. Channel Letter Signs are roughly 80% more efficient than neon-lit Channel Letters. Channel letter Signs have an industry rated life of over 100,000 hours, and they are the most energy efficient signage option to save you and your company on the cost of your electrical bill and future maintenance of your Channel Letter sign cabinet. Channel Letter Signs by Signs Plus is Kentucky’s Number #1 choice for indoor and outdoor lighting advertising sign needs. We can also design a custom designed Channel Letter sign to fit any business environment, from Channel letter signs, wholesale channel letter cabinets, channel letter supplies, business signs, custom signs, reverse channel letter signs, open letters, customized logos, custom backlit signs, custom channel letter logos, channel letter fonts, custom design Logos, wholesale channel letters and supplies, LED signs, dimensional signs, vehicle signs, aluminum signs, compliance signs, directional signs, brail signs, farm signs, vehicle graphics, 3D signs, form letters, lit signs, sandblasted signs, school signs, changeable message signs, church signs, outdoor signs, cabinets, letters, channel, and just about any sign you can imagine. Signs Plus, LED Channel Letter Signs and wholesale Channel Letter Supplies are significantly lighter in weight; easier to install, and use a lower power voltage source avoiding expensive permits. LED Illuminated Channel letter Sign Cabinets provide the opportunity to create energy and maintenance savings over a long period of time. Channel Letter Signs are so much more efficient and less expensive to maintain and many businesses are removing the neon light source from their signs, and replacing them with Channel Letter LED Signs. Why? Ease of maintenance, better design and more importantly it saves money. We also make Custom Sign Cabinets to accommodate and protect the internal components. Wholesale Custom Channel Letter Sign Cabinets provide the optimal value and low maintenance. If you’d like a quote on how your company can move up to energy efficient LED Channel Letters, call or email us to arrange a free quote. We think you will find LED Channel Letter Signs to have the most value and energy savings on the market. We have a huge selection of stock fonts and colors from which you can choose. Call Signs Plus Channel letter design staff for free quote at (859) 519-7820. Send us your details and specifications for you Channel Letter Sign and let us help you to a better quality of signs. Signs Plus, LLC has the Expertise and Dedication to perform all your wholesale channel letter sign installation and electrical sign needs. Energy Efficient — Get more than 100,000 hours of life and 80% more efficient. Extremely Durable Signs — Thick welded aluminum letters will not rust. The Perfect look — Computer-Generated cutting of your channel letter sign. Designed not to Break — We use impact modified plastics for our channel letter signs. Protected Plastics — Designed not to fade and always looks bright. Resistant Plastic Coatings — Vandals will have a very difficult time causing damage. Self-Cleaning Faces — Your sign face will never look dirty. Bright Illumination — Great quality illumination over each channel letter. 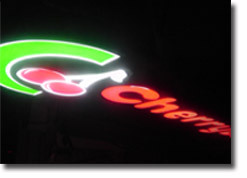 Channel Letter LED Signs — Draws more attention to your business. Channel Letters Supplies — Channel letter parts and installation supplies available. Custom Sign Cabinets — Made to fit perfectly with all components. State Licensed Electrical Contractor — Certified for all your electrical sign needs. Trained Certified Signs Technicians — Fast and friendly quality work every time. Industry Experienced — 45 YEARS of experience and knowledge. In-house Made Neon — Perfect illumination with great colors on each letter.